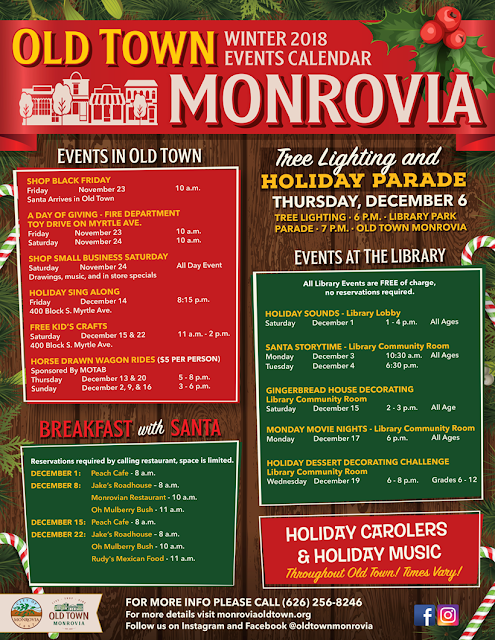 Santa will arrive in Old Town at 10 a.m., so bring your family and friends and shop small this Black Friday! Small Business Saturday is a day dedicated to supporting small businesses across the country every year on the Saturday after Thanksgiving. There will be drawings, music, and in-store specials all day long! Spread the joy this holiday season by participating in the Toy Drive on Myrtle Avenue! Starting at 10 a.m. on Black Friday and Small Business Saturday, members of Monrovia's Fire and Rescue will be out on Myrtle Avenue to collect your toys, so stop on by and make a child happy today! We will be holding a Holiday Sing Along for carolers young and old, musically gifted and tone-deaf! All are welcome! Come for the tunes, and stroll along Myrtle afterwards for shopping and dessert! The sing along will be taking place on the 400 block of Myrtle Avenue. Friday, December 14, 8:15 p.m.
Thursdays, December 13 & 20, 5:00 - 8:00 p.m.
Sundays, December 2, 9, & 16, 3:00 - 6:00 p.m.
Saturdays, December 15 & 22, 11:00 a.m. - 2:00 p.m.
Breakfasts with Santa in Old Town Monrovia – Every Saturday in December! Saturday, December 1, 1:00 - 4:00 p.m.
Monday, December 3, 10:30 a.m.
Saturday, December 15, 2:00 - 3:00 p.m.
Wednesday, December 19, 6:00 p.m. – 8:00 p.m.